Too much dialogue and very little happening, the story is weak and the action is very minimal. A movie that is handled terribly, this film is loaded up with conversation and takes a full hour to finally get to it’s plot. That’s a hell of a lot of setup. The story about a lawyer who gets mixed up in the drug trade, falls victim to an unlucky coincidence, and now has the drug cartel coming after him, is pretty decent. The problem is the way that this story is told. There is so much dialogue here, and most of it is not about anything important (or even related to the plot), at all. When the action finally does pick up in the second half, it is over way too quickly, and we go right back to boring dialogue. What a mess. The Counselor is a bad movie. It got universally panned by critics when it came out, and became notoriously known as an awful film. Maybe that criticism is a little harsh, because you can certainly see what the movie is trying to do and that it had good intentions. I’ve seen many worse films lately that received better reviews (Kill Your Darlings for example), but this movie is the one that got put down the hardest. That probably has something to do with how much talent was involved. On the cast side alone, there’s Michael Fasbender, Javier Bardem, Penelope Cruz, Cameron Diaz (our two Vanilla Sky actresses), and Brad Pitt. That’s a pretty stellar cast. They probably all came out for this one because of the names that were involved behind the scenes of making this movie. Those names are Ridley Scott and Cormac Mccarthy. Scott is a talented filmmaker who has turned out some of the greatest classics, from blade runner to alien to gladiator. and mccarthy is the author who wrote the original story for no country for old men, as well as other films such as the road. the thing that’s special about this movie is that it’s mccarthy’s first time writing a screenplay and not a novel. as it happens, his words and ideas need to be channeled through someone else, like the coen brothers did for no country. here, he and scott end up with a pretty lousy movie on their hands. there are many problems with the counselor, but the biggest one is that it is just too wordy. in the first half of the movie (the first hour), every single scene is dialgoue. now, luckily, it’s not always the same two charcters having a conversation, and we get introduced to a whole bunch of different characters, all of them with mouths full of stories and information that they can’t wait to spill. but when it’s one scene of dialogue after another, it doesn’t really matter who the characters are. it’s just overkill at that point, and not understanding how to keep an audience’s interest at all. aside from the dialogue, very little happens in the first half of the movie. that’s probably because the scenes are so heavily saturated with dull and irrelevant conversation. whatever story there is gets shuffled off to the background. by the end of that hour, only one real thing has happened. michael fasbender’s character, counselor, has agreed to get involved in the drug trade, getting in on a shipment with some big investors. in order to understand how this could be the only thing that happens in a full hour of the movie, it’s important to realize what exactly they’re doing with the dialogue here. they are explaining everything. and by everything, i mean little things that don’t even matter. the opening scene with the counselor and his girlfriend, laura (cruz), in bed, is fine. it’s kind of artistic the way they stay under the covers and we hear their conversation for a while. but as soon as that scene is over, the trouble begins. counselor goes to a diamond dealer to buy an engagement ring and we suddenly get a lecture about diamonds. we get tons of information about every little thing there is to know, and the funny thing is that none of this has anything to do with the plot. this is mccarthy thinking the diamond industry is interesting and that he can throw in some information and that we might be fascinated. boy is he wrong. plot is everything and if you’re not moving that plot along, then you are just wasting time. that’s pretty much the story of this movie. after the diamond scene, we get a scene of javier bardem’s character, reiner, explaining an execution weapon to counselor. just like the diamond guy, reiner goes into every detail about how the weapon works. now i realize they’re saving us from seeing the actual weapon until later on in the movie, but how about something? some visual help. maybe reiner draws the weapon or looks it up on the internet. it’s just too much talking, and not enough showing. after the first hour is over, nearly on the mark, a story finally starts to come out. that’s because the counselor represents a woman in prison (rosie perez), and her son happens to be the one transporting the drugs across the border, on his motorcycle. it’s a little more complicated than that, with the son having something in his helmet that grants access to the shipment or something, but the main thing that happens here is the son is murdered. it’s a very cool death scene involving a metal wire that goes across the open road and decapitates the biker when he rides by. i love all the details involved in setting this death scene up, including the killer going to a showroom and measuring the bike. these are the kinds of details that count, because they actually have something to do with the movie and the story. things start to get really bad for our heroes at this point because the investors known that counselor was representing the woman, (and also her son, whom he helped get out of prison), and they think he was involved in the murder. they think that he had the boy killed and took the shipment. it doesn’t exactly make sense because the boy didn’t steal the shipment and run off. instead, he was killed. if counselor was working with this boy, then they’re saying he just killed the guy he was working with. still, it is made very clear to us that these investors do not believe in coincidences, and so they are convinced that counselor is the one who took their shipment. after the motorcycle rider decapitation, there’s a cool shootout scene involving two truck drivers who are pulled over on the side of the road. things are starting to look up for once, with two exciting scenes in a row. and then, just like that, the movie goes back to the way it was before. more talking. more nothingness. there are a few more deaths here and there, but they are quick, and uninspired. maybe it’s that the movie has completely lost our attention by the time they finally do occur. the counselor is a mess of a movie. i thought at the very least that this film would be on the same level as the brad pitt, all-star cast film from last year, killing them softly. that movie wasn’t very good either, but at least it knew how to tell a story. and it didn’t have ridley scott and cormac mccarthy behind the scenes either. but there is a such thing as too much talent (see the expendables movies), and too little attention to the things that actually matter. 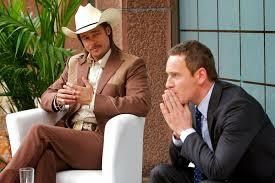 the counselor is basically a series of conversations and of chracter rattling off stories and wisdom about life. none of it actually means anything in terms of the story, which seems to be the least thing on anyone’s minds here. when that story finally does come out, after an hour into the film, it still isn’t handled correctly. the movie had good intentions, and i have no problem with the premise about the drug cartel coming after the counselor because of his connection to the kid who was killed. it’s a fine idea for a story, but with this movie they really didn’t know how to handle it.